Peter Popham’s biopic of Aung San Suu Kyi is well crafted with new insights from her trusted aide but fails to deliver any dramatic revelations. Burma has been in the limelight for the past few months. A number of reforms have been carried out by the quasi-civilian government led by reformist President Thein Sein, including the release of political prisoners and Aung San Suu Kyi’s National League for Democracy being entering Parliament. The response from the international community has also been rather optimistic with the easing of economic sanctions by the United States and European Union. Many foreign companies including General Electric and Coca Cola have made moves to invest in Burma. And, of course, when people talk about Burma, it is impossible to leave out Suu Kyi, who spent much of the last two decades under house arrest. In Burma, people throng to listen to her speeches and to catch a glimpse of her visits. The Nobel Laureate’s picture is now regular features in Burma’s media—as if it guarantees increased sales—and also widely posted in social networks such as Facebook. Wherever Suu Kyi travels, she is embraced with warmth, love and admiration—not only by Burmese people but also the international community. More than ever, she has become a global icon after being able to travel outside Burma for the first time to attend forums and officially accept her Nobel Peace Prize in Norway. A number of books have been written about the 67-year-old and her role in Burma’s political struggle. The Lady and the Peacock by Peter Popham—the latest biography on Suu Kyi—takes on a more personal outlook of her life. Popham includes journal entries of Ma Theingi who was Suu Kyi’s personal assistant and companion during her arduous election campaign tour of 1989 and with whom she later fell out. Those journal entries were recorded at the request of Michael Aris, Suu Kyi’s husband, and were made available to the author through an anonymous friend. 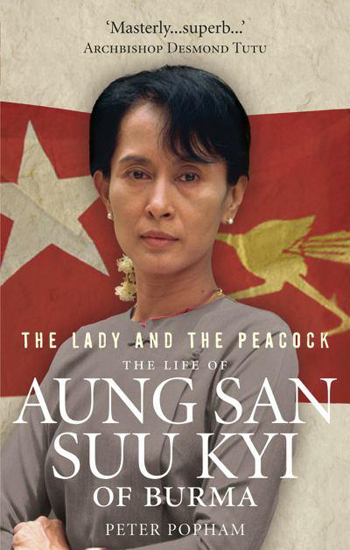 By dividing the book into five parts—Suu Kyi’s father Gen Aung San; her years growing up in India; her life in England; her involvement in Burmese politics from 1988 to 2002; and after 2002—Popham attempts to analyze Suu Kyi’s life and how her family background and the historical events in Burma have shaped who she is today. He does a fine job of depicting the different stages of Suu Kyi’s life: from her formative years, to a student, then a housewife and finally an inspirational political leader for the Burmese people. Many of Suu Kyi’s attributes are also excellently portrayed in the book: her sense of duty for being “her father’s daughter;” her strong morality regarding Burmese traditions and culture despite growing up in foreign countries; and her sense of discipline with her children. Popham also describes her resolute determination and courage when sticking to her goals despite being subjected to physical and mental hardships—the house arrest for most of her years in Burma; the denial of a visa to her dying husband; the brutal attack on her life in Depayin in 2003 when many of her supporters were killed trying to protect her. Through interviews and comments made by Suu Kyi’s close friends in Oxford, rare snippets about her are included. Like many others in life, she studied a course in which she was not interested at the insistence of her strict mother and ended up with an underwhelming third class degree albeit at prestigious Oxford University. Popham is such an accomplished storyteller that most people will be caught up in his description and narration about events in Suu Kyi’s life. A list of references on articles and books, written about Burma and Suu Kyi, at the end of the biography indicates the level of extensive research Popham carried out. Yet, whenever he tries to provide an analysis of events in Burma, as a Burmese person myself, I do not feel that he possesses enough in-depth understanding about the myriad underlying issues in the country—the history of ethnic conflicts, national reconciliation and the reform process, to name but a few. In contrast, Bertil Lintner, a veteran journalist who has written seven books on Burma and has reported on Burmese issues for over two decades, is able to give a concise and yet thought-provoking analysis in his offering Aung San Suu Kyi and Burma’s struggle for democracy. Two critical points cast a black cloud over the credibility of Popham’s book. First is a statement, included without any source, that now-retired Snr-Gen Than Shwe “admitted [to] ordering the massacre, with the aim of ‘eradicating’ Aung San Suu Kyi.” Never has such admission been recorded and it is unimaginable for Than Shwe to so brazenly make such a claim. Second is Popham’s accusation that Ma Theingi was responsible for his repatriation from Burma during a visit. It seems that his close association with Michael Aris, who regarded Ma Theingi as being disloyal, clouded his view of her. Without any credible proof, he agrees with accusations of Ma Theingi having “gone over” to the junta’s side after she became vocally critical about Suu Kyi and her party’s policies. I also wonder about Popham’s intention to include an assumption by Suu Kyi’s friends about how she fell in love with a Pakistani student, who later worked in the Pakistani Foreign Service and who declined to be interviewed for the book, during her second year at Oxford. Was this just an attempt to sensationalize Suu Kyi’s love-life during her younger days? He also seems as star-struck when he likens Suu Kyi, giving her first political speech to an audience while in her mid-40s, to a 17-year-old girl. Without a doubt, all of us will agree how youthful Suu Kyi appears even now. However, just from seeing Suu Kyi’s picture from that time, it is clear that comparing her to teenager is a gross exaggeration. At times, the book tends towards being unnecessarily longwinded with exhaustive details about political events in Burma. Popham could have just included the concise versions of those events which are significant for Burma’s history and Suu Kyi, but then he would not have been able to fill up all those 398 pages. For those who have read other books written about Burma or Aung San Suu Kyi, the only new or interesting material is the entries from Ma Theingi’s journal. Although the quotes provide readers with a rare glimpse of the intimate details into Suu Kyi’s life, it would have been better not to include quote-after-quote, containing a repetitive and sometimes trivial details like what Suu Kyi wore and what she ate, continuously page-after-page. Popham states that his story on Suu Kyi is not “just the story of a courageous woman who challenged a military junta and lost”—an assertion that Suu Kyi herself never made—but of someone who has a more “complex and interesting” side. No doubt that Ma Theingi’s journal entries and the chapter on Suu Kyi’s childhood years are interesting, enhanced by the good storytelling skills of Popham, and contain details other prior biographers have left out. Other than that, Popham might have been too presumptuous about his aims for his book and his understanding on his subjects—Suu Kyi and Burma.